My first thought on seeing a picture of the IMS HVHA on Thetubestore.com website was, ‘I wish I’d built that!’ I’m a dyed-in-the-wool DIY person. A few years ago I’d bought a HPA kit from an Australian firm. It was cheap, about $30, and used the same tubes as the IMS HVHA under review today. The Aussie kit used a lowish grade opamp for the output stage. It was a decent value for the price and included a thin pc board and a bag of so-so grade parts. The kit was large and clunky compared to the HVHA and used two AA and a single 9 volt battery. An enclosure was not included. At the time I bought about a dozen extra 6418 tubes as well. I assembled the Aussie kit but substituted better capacitors and a better volume pot. The sound was not too bad but the 6418 tubes would ring like crazy when struck lightly. Rubber O-rings included with the kit were meant to be placed around the tubes to dampen the ringing. These worked to a degree but didn’t eliminate it entirely. I cycled a dozen or so 6418’s through that amp and found about four that would only ring for a second or two when struck. Some tubes would ring and even sound like they were oscillating at about 1000Hz for many seconds after being struck. I had planned to build an improved version of the circuit using select 6418’s and a Burr Brown OPA2134 powered by a bipolar (positive and negative) supply, but never got around to it. The IMS amp uses two 6418’s (one for each channel) for the gain stage. 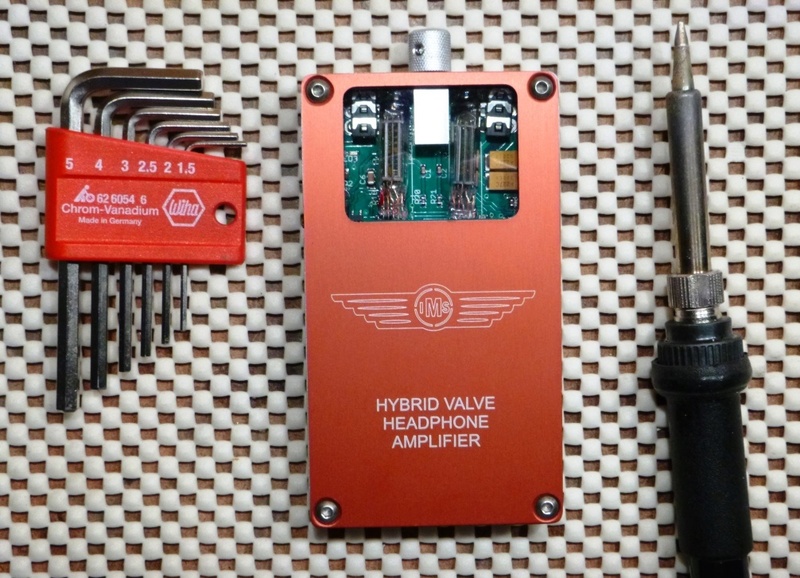 An OPA2134 dual opamp provides the current necessary to drive headphones. The case is anodized aluminum and the quality of the metal working is quite good for a product in this price range. It is however quite slippery and I’d recommend a rubber cellphone-type of cover, to reduce the possibility of it slipping out of one’s hand and provide a degree of shock protection as well. The unit I reviewed was the analogue-only version, the optional DAC board was not available. In this case the mini USB jack on the right side of the case is used only for battery charging. There are two 3.5mm stereo jacks on the top edge of the case, bookending the combination on-off and volume control. On the left side of the case is an attenuator switch to provide easier volume adjustment with high sensitivity ‘phones. 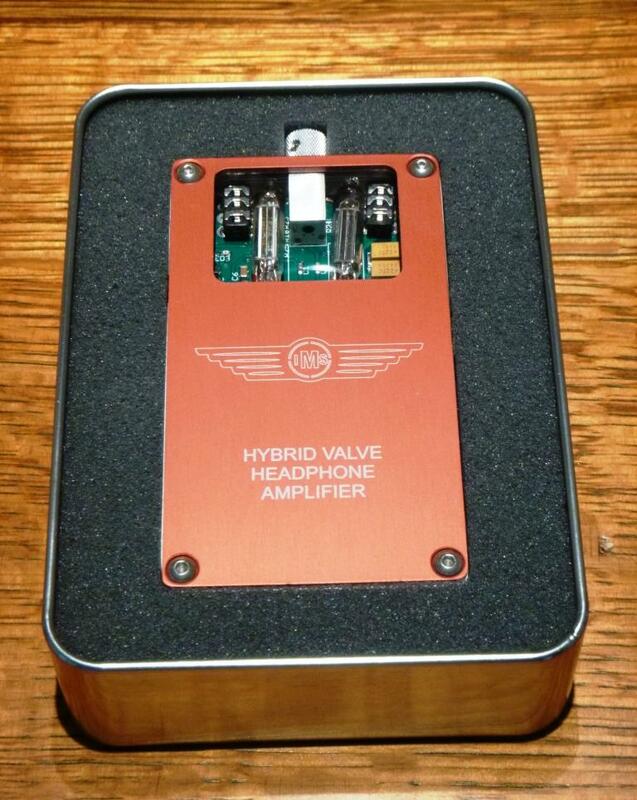 The amp comes in a cool metal box, a miniature version of a cookie tin. There is foam in the tin box cut to cushion the amp. Two cables, a short 3.5mm to 3.5mm interconnect and a short Micro USB to standard USB are included. As the IMS website touts the HVHA as aspiring to audiophile standards of sound quality, I feel that it should be judged as such. In a nutshell, I find that it falls short of those goals. I take no pleasure in writing a negative review of the work of young a start-up. I take even less pleasure when Thetubestore.com, a sponsor of the WoS site and a very generous loaner of amplifiers and tubes for review, is the IMS distributor. On a personal note I have been a customer of Thetubestore.com for at least a decade and have found their products and service first rate. This is my first product review for WoS and I really wanted to like this product. I was hoping and assuming that IMS had sorted out the ringing and oscillation issues with the 6418 tubes but this is not the case. I like to think of myself as a fair person. I want to be fair to the manufacturer of the product and their distributor, but most of all I want to be fair to the person who reads this review and might plunk down their hard earned money for one. To give IMS the benefit of the doubt I’m treating the HVHA reviewed here as the beta version of what I hope will be a better product once a few issues are sorted out. It’s not the job of a reviewer to assist in the development of a product. However as this is the first product from IMS, I feel compelled to assist. I hope that they will not be offended, and take my criticism and advice in the constructive manner intended. If other small manufacturers of audio components object to this treatment, they can be assured that I would extend to them the same. I’ll deal with the cosmetic and ergonomic issues first. The screws securing the back plate on the amp protrude, and could scratch a surface the amp is placed on. A foam pad would be a good idea and also help keep the amp from sliding around. The input and output jacks straddle the volume pot and when straight plugs are inserted it is difficult to adjust volume. The analogue input and headphone output jacks are recessed about 0.5mm or so from the top edge and as such, some plugs must be inserted fully against the case to make a proper connection. Any slight cable movement might, and in my experience has, lead to a poor connection. The LED’s illuminating the tubes are far too bright. The tube filaments generate very little light, so low in fact that a very dark room is needed to see them glow. I can appreciate that a young enterprise needs to have a differentiator to get their product noticed in the marketplace. However, I can foresee a situation in a public place where the LEDs could call unnecessary attention to a person, and some unscrupulous type might then ‘relieve’ the owner of his or her amp. Dimmer LED’s, or a switch to turn them off when the amp is in use, would be advisable. I pride myself that at 60 plus years old, I still have reasonably acute hearing. I’ve always worn ear protection when using power equipment and when motorcycling. Some years ago when I was tube rolling a couple of headphone amps, I burned a CD containing tracks by Peter Gabriel, Sarah McLachlan, Loreena McKennitt and Mark Knopfler. Not many of them are demonstration quality and a few are far from perfect, but they are music I like and have not gotten bored of, even through hundreds of hearings. My auditioning is not limited to these tracks but I start out with them as I can cut to the chase very quickly with regards to sound quality. With the attenuator cable connecting my Cambridge 840C CD player to the HVHA, listening commenced. AC power was conditioned with a PS Audio Power Plant Premier. The HVHA was powered by its (fully charged) battery. Generally speaking, high-impedance ‘phones require more voltage than current to make them sing, which is why OTL tube HPAs are sometimes used to drive them. Low-impedance ‘phones on the other hand, typically require more current than voltage – which is why they are used with portable battery powered devices. My primary headphones are high-impedance Sennheiser HD600’s, and the HVHA powered them reasonably well even though it is spec’d for low-impedance ‘phones. The other headphones used for auditioning were low-impedance AKG K550’s; these partnered well with the HVHA, in that they are on the sensitive side compared to some low-impedance ‘phones. AKG 701’s did not work well at all, as these low-impedance ‘phones are both current and voltage hogs. I preconditioned the IMS for about 50 hours, playing my demo disc on repeat before attempting any serious listening. I didn’t definitively check the battery life, but it will play for at least 8 hours on a full charge. The HVHA accumulated over 200 hours of running time during the review period. When first powered up, the HVHA makes a bit of a squeal, a ringing sound and then an approximately 1000Hz oscillation, but this settles down within a few seconds. The volume pot is noisy at low settings, sounding scratchy in the headphones when rotated. If tapped the amp will ring and oscillate again but this dies away after 5 seconds or so. A friend who is a dozen years younger than I hears the ~1000Hz oscillation, faint though it may be, all the time. This is hidden when music is playing but all the same it shouldn’t be there. This is what I found with the worst of the 6418’s when I was experimenting about 5 years ago. On a significant percentage of the tubes oscillation was always present. The tubes in the HVHA are suspended by their leads and ‘hang’ in space free to vibrate. No attempt has been made to dampen vibration and/or oscillation. A big blob of Blu Tack between the tubes and the PCB might reduce the pinging and oscillation (I didn’t try this), but would likely block the light from the LEDs. The sound of the HVHA, once you overcome the low level oscillation, was alright on its own, but not spectacular in any way. I think that to properly judge a component it must be compared to others of similar type and price. For comparison I used an inexpensive hybrid HPA that has a 12AU7 input tube (not my favourite gain tube by a long shot), and the same OPA2134 chip that the HVHA uses. An entry-level Headroom solid-state HPA (at least two decades old) was the other amp used for comparison purposes. I took notes while I listened, but the result was the HVHA was bettered by the two other amps. The comparison amps were clearer, more extended at the frequency extremes, smoother and more detailed across the whole audio spectrum. The comparison amps also produced a more spacious ‘head’ sound. The HVHA by comparison was much less involving. Music just seemed ‘flattened’, is the best way I can describe it. When a component becomes a chore to listen to it’s an indication that something is not quite right. Looking at the picture of the circuit board on the IMS website, I suspect the highlighted SMT caps couple the OPA2134 to the output jack. This implies that the opamp is not directly coupled to headphones and the opamp does not have a bipolar supply. This not necessarily a bad thing, but in my opinion direct coupling is better; the best capacitor is no capacitor. I can’t comment on the DAC board as it was not available in Canada at the time of this review. Even if the DAC proves to be very good it will, in my opinion, be compromised by the amplifier following it. I think the parts in this amp are capable of better sound than presented here. The OPA2134 is capable of decent sound and the 6418 tubes if selected and properly damped can do decent things for music as well. As mentioned earlier it pains me to say that I find the performance of the HVHA not quite up to the standard that audiophiles expect. The sonic issues which an audiophile might object to, could be non-issues for non-audiophiles. I still can’t recommend the HVHA to non-audiophiles because they might outgrow the HVHA if upgrading to better sources and headphones. Younger ears than mine might object to the oscillation issues as well. Change the CNC programming so that there are two small depressions machined into the top edge to better expose the input and output jacks. This should be an easy fix. Change the resistors on the input attenuator so that the amp will not be overloaded by the typical output levels found on many source components. Again a fairly easy fix. IMS states that the 6418 tubes are matched to within 1%. The test jig used for matching should be upgraded to incorporate a way of quantifying the ringing/oscillation issues. Not necessarily an easy fix and it might mean discarding a certain percentage of tubes but this test is essential in my estimation. The tubes should be damped. Not necessarily difficult or expensive but again essential in my estimation. As for the cause of the ‘flattened’ sound noted earlier, I cannot speculate. Maybe once the other issues above are addressed this will sort itself out to some degree. If IMS can make it through their adolescence they might evolve into an enterprise with decent sounding products right out of the gate. As much as I love tubes, I’d like to see a solid state gain stage (the 6418’s might be just too problematic in a production environment) and a bipolar (+ and – supply) powered output stage that would not require output coupling caps. 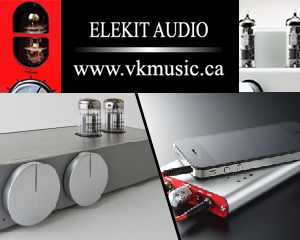 Then IMS might have something that audiophiles would like and could recommend to their non-audiophile friends as well.